Sometimes you need to put formatted ObjectScript in a post. To do that put the code into the editor, select it and click on ObjectScript button. Once you save/preview the post the code will be highlighted as ObjectScript. We are introducing a new feature on DC site - Best Practices of InterSystems Data Platforms. It is the tag, which highlights articles on DC considered as Best Practices on how to develop, test, deploy and manage solutions on InterSystems Data Platforms. Drag-n-drop image from your disk to a post and adjust the width after that. Copy the image to a clipboard (Ctrl+C) e.g. from another web page or from any text editor and paste it into the post. If you see this page you are in the InterSystems Developer Community! This is the place where you can read about and discuss InterSystems products and technologies: InterSystems IRIS, Caché, Ensemble, HealthShare, DeepSee, and iKnow. What type of content can I find here? 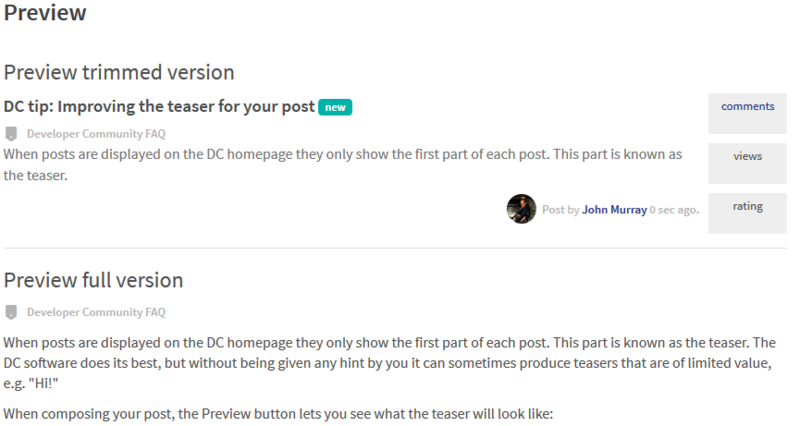 When posts are displayed on the DC homepage they only show the first part of each post. This part is known as the teaser, or the trimmed version. The DC software does its best, but without being given any hint by you it can sometimes produce teasers that are of limited value, e.g. "Hi!" Today there are two main settings for your email notification subscriptions. In this case, you'll get only one notification for every new article or question posted on DC and every answer and comment if you checked this option. Here are some recipes with this option. We have a lot of good articles posted on Community to the date. Even more questions with great answers (see the stats). Thank you for your contribution! So sometimes it worth to use search to find an answer or the best practices or the post you remember was posted but cannot find. The goal why we are posting questions on Developer Community is to get the answer. Here is very simple guidelines document on how to ask questions which would get answers. When you post a question you need to feel 3 fields: title, body, and group. And tags. A good title should contain the brief description of your problem - it should not be longer than 80-90 symbols. But brief doesn't mean one word. These are not very good titles for questions: Cache, Ensemble, Peace, World. I wonder how to change the login email that I've in Comunity. According to My acount - Account setting, I can change it using the http://login.intersystems.com portal, however there is not any link or option to change it. Is there other way to change the email? Currently I'm using the work email and I want to change to personal email. P.S. The email that I have associated in Global Master I have already modified it, so if I modify the one in the Community, both accounts will be linked, isn't it? Today DC supports the notifications for the posts' updates. It means if someone changes the post text, title, group or tag you can be notified about that. But this notifications just inform that there were updates, but do not show what exactly was changed in the post. So through this, you can get the notifications for the posts from previous years without any reason what's happened. I would suggest to turn off this types of notifications until we'll implement the details in notifications, what exactly was changed in the post and why did you get it. 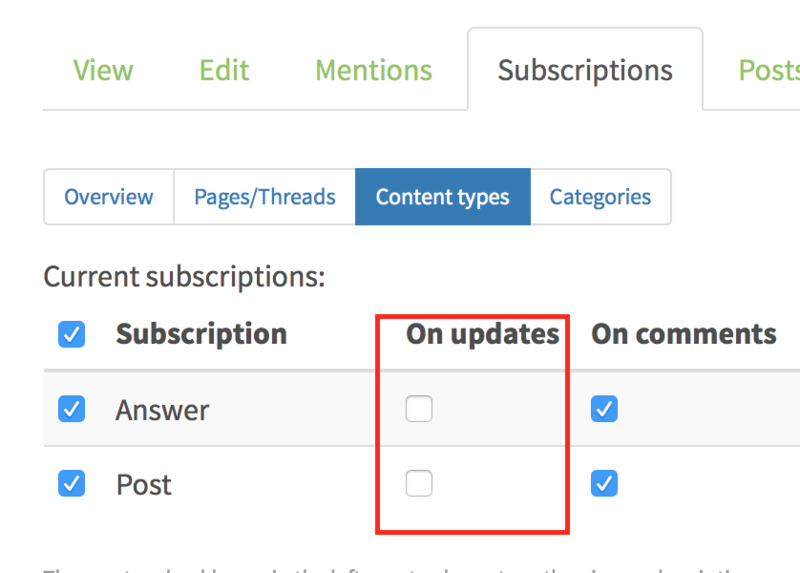 To turn off the update notifications go to your subscriptions settings and turn off the updates triggers in the Content Types tab. First, register to make postings. Here is the short gif which demonstrates how to post, paste text from Word, make COS highlighting and put Group and tag. We've updated Developer Community (DC) portal and here are some good news. Now you can insert in your post highlighted parts of code. It works with help of highlight.js library. To illustrate it I took some code snippets from Fabian's article. 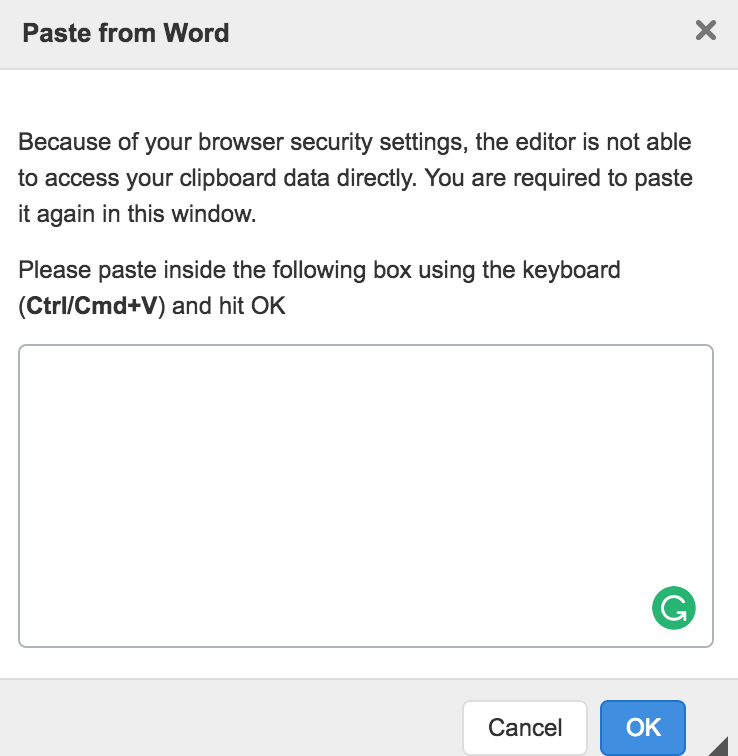 as described in How to post an article from Word or Google Docs, you can use the Paste from Word button to paste content you have copied from a Word or Google Docs document into a Developer Community post. If you prepare your longread for DC in Microsoft Word or Google Docs there is one very easy way how to add your formatted text and images in DC post at once. 1.Click Create Post on Developer Community. 2. Copy all the text in Word o GDocs to the buffer. 4. Paste the text to the opened window an press OK.
5. See the formatted text with images in your post. Save it as a draft or post it.